Staff Sgt. Robert Gutierrez, Jr. took a bullet and saved a dozen troops in an Oct. 5, 2009 firefight in Afghanistan where his personal heroism was unrelenting. Gutierrez should receive the Medal of Honor. He is scheduled to receive the Air Force Cross on Sept. 21, 2011. This is a serious award that many Americans have earned with their lives. It should not be viewed as a consolation prize or as short change for Gutierrez. The fact remains, as we enter our eleventh year of war in Afghanistan, as we continue conflicts in Iraq, Libya and the Horn of Africa, successive Republican and Democratic administrations and their Secretaries of Defense have been too tight-fisted with valor awards – more so than in past conflicts. The president, in the name of Congress, has awarded 3,471 Medals of Honor to soldiers, sailors, airmen, Marines, and Coast Guardsmen since 1861. In World War II, 464 Medals of Honor were awarded. In Korea the total was 135. Afghanistan has lasted longer than both those wars combined, yet the total number of Medal of Honor awards is just six. For actions in Iraq, just four more have been awarded. In offering my opinion that Gutierrez merits the top medal, I’m drawing on decades of studying military actions, military awards, and – at times – military obstructionism. Up front, it must be said that only praise can be bestowed on the men and women who serve on review boards. Without their integrity, we would have nothing. However, review boards act only on recommendations that are given to them. Gutierrez’s shining example of gallantry is one of several in Afghanistan where the Medal of Honor should have been awarded. I have been writing about Medal of Honor recipients since the 1950s, when I published articles in the men’s pulp adventure magazines. I got to know several dozen recipients, including some who are not among the eighty-four recipients alive today. Magazines like Stag, Male and Argosy no longer exist, but our fascination with our heroes and their deeds hasn’t waned, and new acts of bravery haven’t halted. I’ve written about medal recipients in articles, newspaper columns and books. My current book, Mission to Berlin, about American B-17 Flying Fortress crews, includes Medal of Honor actions. On May 1, 1943, Sgt. Maynard “Snuffy” Smith was a gunner aboard a B-17F Flying Fortress attacking U-boat pens at St. Nazaire, France. To put it charitably, Smith was a screw-up. He was an argumentative, rebellious, in-your-face character, and at age 30 was very old to be flying missions. He was not well liked. “A moderately pompous little fellow with the belligerent attitude of a man trying to make up with attitude what his five-foot-four, 130-pound body left him wanting,” wrote another Fortress crewmember, the future television commentator Andy Rooney. Focke-Wulf Fw 190 fighters battered Smith’s formation. Eighty-eight-millimeter flak hit his left wing. It cut the wing tank off. Gasoline poured into the aircraft and caught fire. Smith was in the ball turret. He lost his electrical controls and manually cranked the turret around, opened the armored hatch and got back inside the B-17. It was ablaze. The radioman became excited and jumped out a window without a parachute. The pilot took the bomber down to 2,000 feet. Another crewmember panicked and tried to bail out but got caught on a .50 caliber gun. He jumped high, the stabilizer hit him and he was killed. Around Smith the radio equipment was on fire. Wires were burning everywhere. He put out the fire with fire extinguishers and water bottles. “I did the best I could while being shot at,” Smith said. “They were coming in at us from both sides. While not fighting fire, I manned the workable waist guns. Every time they would make a swoop one or two more planes would go down. Eventually the fighters ran out of gas. In those days pursuit planes were limited to something like 25 minutes. We wound up with four B-17s out of our original 36.” Smith had saved the lives of his crewmates and may have shot down two German fighters. “The tail gunner came crawling out of the back,” Smith continued. “He was all shot up real bad. Blood was coming out of his mouth. He had been shot on the left side of the back. I remembered from my classes on how to handle a situation like this. I laid him down, gave him a couple of shots of morphine which put him to sleep immediately. By doing this, he lived; I am very thankful for that. Secretary of War Henry Stimson, while across the Atlantic from Washington for an inspection, brought along a Medal of Honor that he presented to Smith – but only after the trouble-prone sergeant had to be summoned from disciplinary KP, or kitchen police, duty. The plane began bouncing. “I went forward to find the pilot and co-pilot pretty well shot up. I put tourniquets on them so they could maintain control of the plane. I then went back to put the control cables together as we had no tail control. I remember I repaired the six wires. I then threw all the ammunition out. I didn’t receive burns during all this time because I had wrapped a scarf around my face and hands. “Somehow we got the plane back. The plane was riddled with about 3,500 bullet holes. It was all burned out in the center. There was nothing but the four main beams holding it together. Ten minutes after we landed, the plane collapsed.” The Fortress never flew again. Another valiant B-17 crewmember was Tech Sgt. Forrest Lee “Woody” Vosler, a radio operator on a mission to Bremen on December 20, 1943. Under heavy attack by German fighters, Vosler was seriously injured in both legs when cannon shells exploded in his radio compartment. Bleeding and in danger of losing consciousness, Vosler remained at his machine gun and continued firing as new waves of German fighters swarmed in. When a second shell from a German fighter exploded, smashing Vosler’s radio and spraying him with metal fragments, he refused to quit fighting. Tiny fragments of metal penetrated his eyes and blood poured down his face. When a crewmate offered medical aid, Vosler pushed him off and kept shooting. During a brief respite from fighter attacks, when he should have been tending to his wounds, Vosler worked almost entirely by feel and reconstructed his radio. 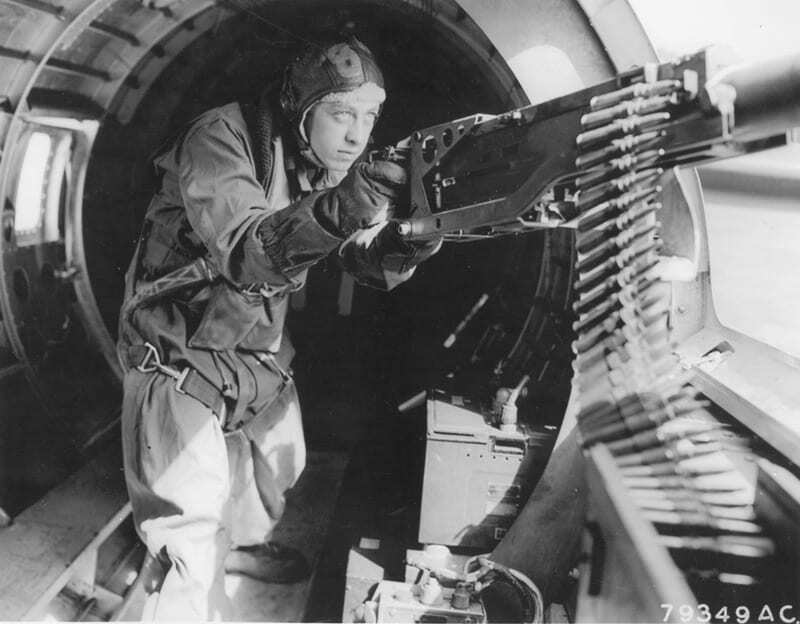 He was able to transmit his B-17s position to the rest of the bomber force. Vosler was barely alive when rescued and spent months recovering and regaining his eyesight before receiving the Medal of Honor personally from President Franklin D. Roosevelt. Smith and Vosler both earned the recognition that came to them. But my point about Smith, a hero who risked all for his buddies but didn’t shine at Sunday school, is that a recommendation for a Medal of Honor for him today probably wouldn’t even be considered. Smith, you see, was nowhere near squeaky clean. In a different era, he was judged solely for his heroism, not for the larger picture painted by his 201 file. Today, he wouldn’t get past military obstructionism. Another form of obstructionism exists within the Air Force itself. In an officer-pilot culture, some enlisted members feel prejudiced against: Out of 18 awards of the Medal of Honor to Air Force members in Korea and Vietnam, only three went to enlisted men. Moreover, today’s Air Force is hesitant to assert itself. “There is a lack of aggressive pursuit of these awards on the part of the Air Force,” said Gary Solis, a retired Marine lieutenant colonel and judge advocate who is considered an expert on awards and decorations. 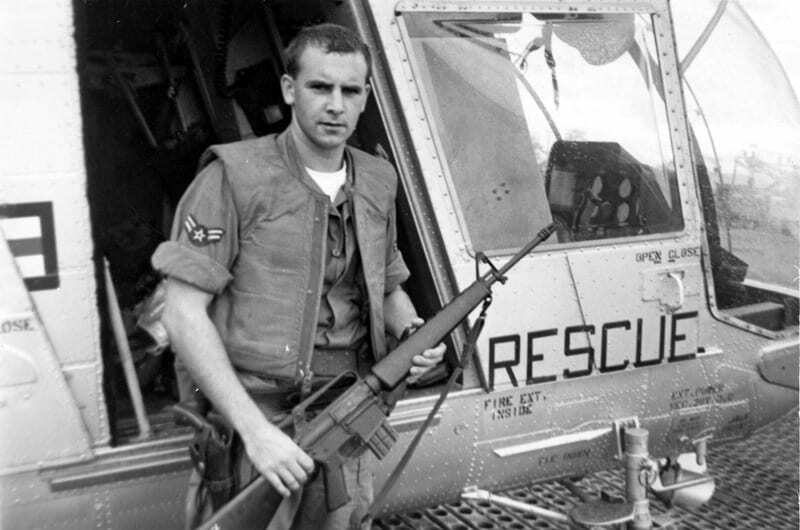 Airman First Class William H. “Pits” Pitsenbarger was a pararescue specialist aboard an HH-43F Huskie rescue helicopter in South Vietnam on April 11, 1966, when his crew was called in to help evacuate American casualties from a dense jungle 35 miles east of Saigon. An Army outfit, Charlie Company, 16th Infantry Regiment, was caught up in an ongoing firefight with Viet Cong guerrillas. From overhead, Pitsenbarger volunteered to ride a rescue hoist 200 feet down through triple canopy jungle. On the ground, he organized rescue efforts. He helped lift many seriously wounded to safety. Though he could have ridden home in his helicopter, Pitsenbarger took up arms alongside the besieged infantrymen. In vicious fighting, the Viet Cong breached Charlie Company’s perimeter and fatally wounded Pitsenbarger. Said the HH-43F pilot, retired Lt. Col. Harold “Hal” Salem: “What Pitsenbarger did was far and above. Here was an Air Force guy, helping Army soldiers he didn’t know, trying to rescue as many as possible.” Salem pointed out that Pitsenbarger piled a body on top of Navarro to prevent Navarro from being killed by flying bullets. Officials in Saigon killed a Medal of Honor recommendation for Pitsenbarger, possibly in part because he was an enlisted airman. He got the Air Force Cross. As I wrote above, that’s a serious form of recognition. It’s not short change. Still, in the June 26, 2000 issue of the trade journal Air Force Times, I wrote that Pitsenbarger, since posthumously promoted to staff sergeant, should receive the Medal of Honor. Thanks to the efforts of a handful of key people including Air Force Secretary F. Whitten Peters, and awards official Joe Linebarger, a presentation of the Medal of Honor was made on December 8, 2000 – and I attended. In an eerily similar reprise, a belated Medal of Honor went on Sept. 21, 2010 to Chief Master Sgt. Richard L. Etchberger, who was killed after a heroic fight in furious battle in Laos on March 11, 1968. His award was so late because of another prejudice: at the time, successive administrations, Democratic and Republican, did not want to acknowledge that American troops were in combat in that country. Pitsenbarger and Etchberger fought with boots on the ground just as Gutierrez did, and gave their lives – as Gutierrez very nearly did. Only two other enlisted airmen have ever earned the top award. Staff Sgt. Henry “Red” Erwin was burned all over his body when he threw a renegade, burning phosphorus flare out of a B-29 Superfortress near Japan on April 12, 1945. Airman First Class John L. Levitow similarly threw a “hot” flare from a battle-damaged AC-47 Spooky gunship in South Vietnam on Feb. 24, 1969. Both suffered severe burns and nearly died to save their aircraft and crews. The Medal of Honor is given for “conspicuous gallantry and intrepidity at the risk of life above and beyond the call of duty while engaged in action against an enemy of the United States.” The deed must be so extraordinary that if it were not performed no criticism would befall the doer. The common ground that Medal of Honor recipients after World War II share is risking their lives to save comrades or civilians or both, sometimes using their bodies as a human shield, knowing fully well the consequences of their actions. In that raging battle fought with guns and rocket propelled grenades in Afghanistan’s Herat province, Gutierrez took a wound and lost fully half the blood in his body. After a medic jammed a syringe into his collapsed lung, Gutierrez continued fighting. He is credited with saving the lives of a dozen U.S. soldiers in his Special Forces unit. The Special Forces troops were out to get the No. 2 Taliban commander in the region, but were pinned down and outgunned until Gutierrez set an example by refusing to die or to give up. For his performance in an earlier action, Gutierrez had already received the Bronze Star with “V” device, signifying valor. So what award is appropriate now and how do we know? What are the criteria for the Medal of Honor and does Gutierrez meet them? The history of the award contains inconsistencies, but most deeds that earned the medal readily meet the “conspicuous” and “no discredit” requirements. Historians have a pretty good idea what kind of deed qualifies, but the decision is often in the hands of a relatively low-ranking commander in the field who must initiate a recommendation; ultimately, it’s a judgment call whether the Medal of Honor is the correct award. The officer recommending the award must make that call. Many in today’s military say officers aren’t well prepared to recommend awards, don’t know criteria, and don’t necessarily write well. Now, officials must bite the bullet. Defense Secretary Leon Panetta must rewrite criteria in order to make it easier for commanders to recommend top awards – and to have consideration given only to combat action, not to other aspects of an individual’s life. Panetta must become proactive in urging commanders to make recommendations and in getting them processed quickly. Gutierrez and other service cross recipients – a heroic Marine named 1st Lt. Brian R. Chontosh comes to mind – should not be disqualified from receiving the highest award because of one final prejudice. They are alive. Of the shamefully low total of ten Medal of Honor recipients in Afghanistan and Iraq, only three are living awards, and for several years we had no living recipients. “The first requirement for the award of a Medal of Honor shouldn’t be a death certificate,” said Uncommon Valor co-author Gresham. Here’s a good first step for Panetta to take. The Pentagon should start the process to get Staff Sgt. Robert Gutierrez the Medal of Honor. Mr. Dorr, thank you, so much, for being an advocate for the nomination of Staff Sgt. Robert Gutierrez, Jr for the MOH. It’s a sad commentary that of the millions who have served in the past ten years of conflict in the WOT that so very few nominations for the MOH have been made, and a service shame that so many of our AF SPECOPs people have been wounded or killed in heroic actions against the enemy and not one, alive or dead, has received the Nations highest honor. The USAF, because of it’s “Obstructionism”, being possibly made up of perceived excuses such as too much effort, too difficult to investigate, not the pilot, officer image, not an action associated with the AF primary mission of flying, just enlisted ground ops, or even personal image, PT profile or any other obscure, negative criteria is quickly gaining the reputation of a prejudiced, discriminatory, not-in-touch-with-the-reality-of-this-conflict service. That image, quite possibly, will be the historical perception of our AF and show that we learned nothing about the shortcomings of AF thinking and its affect on enlisted awards during the Vietnam war and are about to magnify that fact during this conflict. Now is the time for this negative image to be changed, for the Air Force to do a thorough review of previous officer and enlisted awards for heroism. Staff Sgt. Robert Gutierrez, Jr. deserves that review, now, and reconsideration for the award of the MOH. Robert Dorr has hit every point as one rethinks this travesty. It is of course correct that the “Cross” is indeed a deserved honor is beyond question; but I say, if not this, then what, and if not now, when? It is beyond me how this action somehow falls short of the requirements for the MOH. I say again, this is a travesty and it needs to be corrected now, today not later, NOW. Please forward this to any and all that might be interested, and write or call your Senators. We are a great country and these men are part of what makes us so. They did not do it for recognition or reward, but we must still recognize their courage and sacrifice. Obamma, you are Commander-In-Chief. There seems to be a RASH of deserving potential MOH recipients that aren’t even getting recommended. This is happening on YOUR WATCH by your commanders. Take charge for some REAL change! Sfaff Sgt. Robert Gutierrez, Jr is more than entitled to receive the Medal of Honor. The Air Force Cross is no small form of recognition for such gallantry but his actions are certainly worthy of our Nation’s highest honor for such courage, during an engagement where he saved so many lives at a time when he, for all intents and purposes, knew that his own life was spilling out from his body. A grateful Nation should acknowledge this exemplary demonstration of courage and heroism, under fire, by awarding him the Medal of Honor. Lloyd McCarter was the biggest screw-up of the 2nd Battalion, 503d Parachute Infantry Regiment. While the unit had been quartered in Gordonvale, Australia, he’d gone AWOL to New Guinea, where he’d informally attached himself to an Australian infantry unit so that he could fight the Japanese. But he was the best scout of the 2nd Bn., and that night on Corregidor, the night of 1000 hours, what he did was truly extraordinary. The commander of the unit rejected outright the commendation for a Medal of Honor, absolutely refusing to allow such a screw-up as McCarter to become perpetually linked to the repute of the Regimental Combat Team. However that’s not what happened – an awards review board saw the commendation, and then wrote directly to the commending officer, a young lieutenant, deliberately bypassing the West Point Colonel who commanded the unit. The awards review board saw things in McCarter that others did not want to be known, namely that men of honor can be made irrespective of their social graces, irrespective of their popularity, irrespective of whether he’s been busted numerous times, irrespective of the times he’d spent in the stockade. Heroes do have their many human faults and frailties, and that fact should be considered to be entirely irrelevant in the assessment process. Too many bureaucrats trying to pigeonhole people into suitable and non-suitable is a major part of the problem, and they have caused us to take our eye off the ball – was the conduct deserving of the medal of honor, the character of the man being irrelevant. The award should, as you point out, reflect performance on the battlefield, not behind the wire, at the table, or while off duty. Our heroes don’t always come clean, square-jawed, gentlemanly and well-spoken.